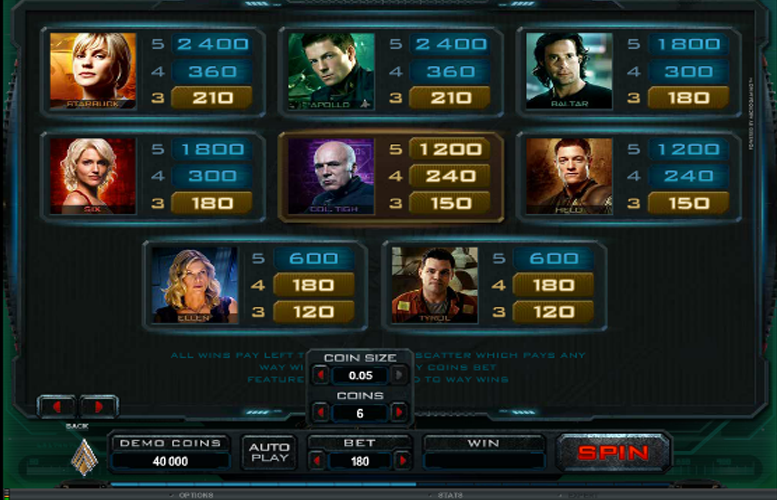 Based on the modern reboot of the classic sci-fi TV show of the same name, the Battlestar Galactica slot is the game we’re reviewing here. Utilising real images and video content from the show, the slot has five reels, three rows and a full 243 ways to win. What’s more, it is also packed full of additional game modes and bonus features. Players are able to gain ranks like a character on the show whilst playing through three different game modes and looking to trigger free spins or achieve special wild symbol bonuses. All of that combines to make the slot’s payouts impressive and is provided alongside really eye-catching and attractive graphics. Real images from the TV show appear on the reels and an impressive soundtrack and sound effects help to add to a cinematic experience. The slot includes a wide range of added gameplay features, including free spins, alternate game modes and wild symbols which work differently in different game modes. The 243 ways to win format makes winning combinations more likely and whilst standard payouts are generally quite small the total 70,000 coin jackpot which can be won is not to be sniffed at. Despite a comprehensive paytable which can be accessed by any player, it is really quite complicated to work out exactly what different winning combinations pay out. Whilst there are a large number of special features, there isn’t really a bonus game or round to complement the main game and free spins. As a 243 ways to win format slot, Battlestar Galactica pays out on a range of different three, four and five symbol combinations when they appear on the reels. The most valuable symbol combinations are those which include five of the wild symbols or five of the symbols depicting a major character from the TV show. The above means a top jackpot of 70,000 coins is available on this slot machine. 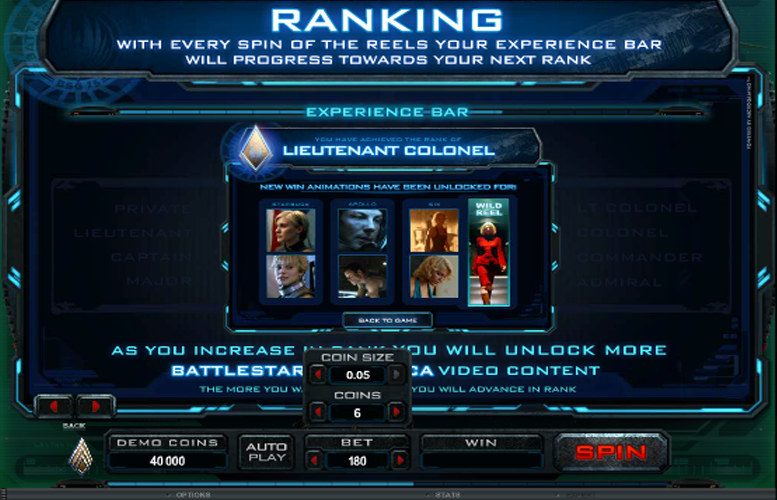 The Battlestar Galactica slot doesn’t have a traditional bonus game but instead has a range of game modes and a special Ion Storm feature. The slot’s Flight Mode means that random symbols can be turned wild during gameplay and that wilds can also split in two to create more winning combinations. Run Mode, meanwhile, is triggered when the ‘Faster Than Light’ symbol appears on the middle reel and during that mode one of the lower value symbols on the reel is transformed into a mystery symbol for added wins. 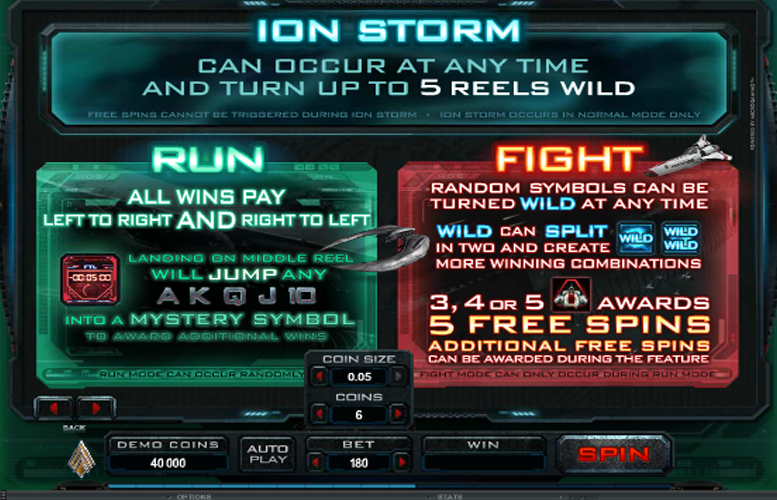 In Normal Mode, an Ion Storm can occur at any time and is able to turn anywhere up to all five reels wild. It is if this happens, that the highest possible main game jackpot of 70,000 coins results. It is if three, four or five spaceship scatter symbols appear anywhere on the Battlestar Galactica reels that a player triggers 15 free spins. Those free spins are subject to a very handy three times multiplier and in Flight Mode, 20 are triggered rather than the normal 15. 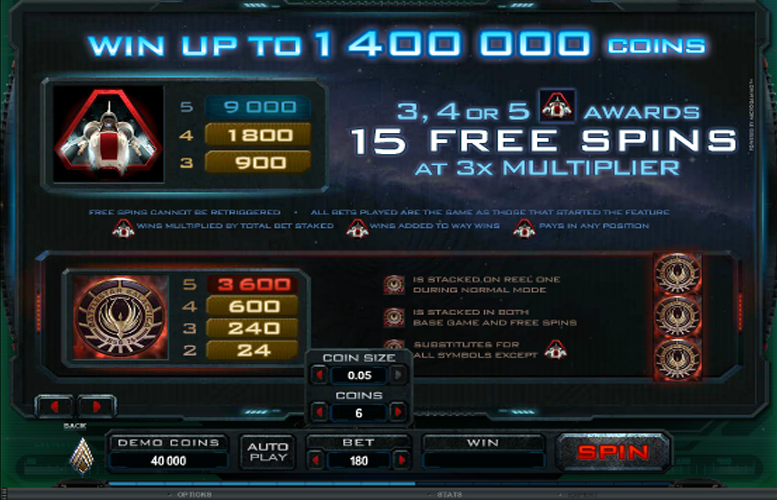 As a 243 ways to win slot, Battlestar Galactica players do not need to worry about altering the number of paylines to control the size of their bet. Instead, they need only choose a coin value and a number of coins which they wish to bet. Available coin values range from 1p to 5p and the number of coins can be set anywhere between one and ten. 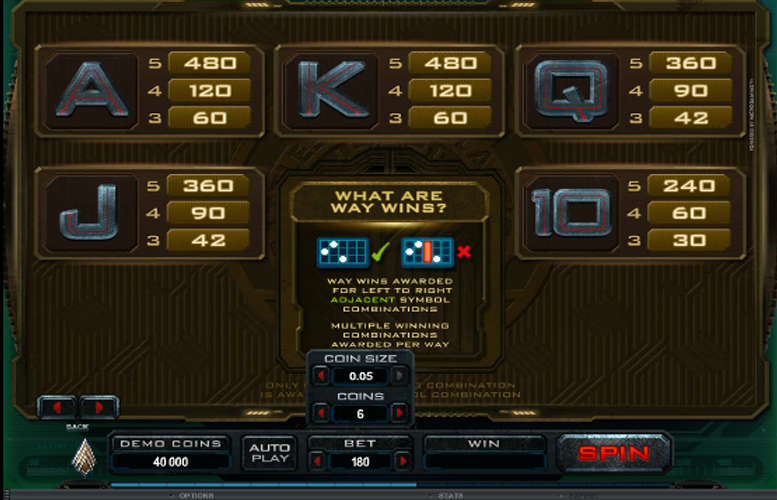 The two options chosen by a player are multiplied together and then multiplied by 30 to give the total bet per spin. The maximum possible bet, for example, is a total of £15 (5p x ten coins x 30). Battlestar Galactica is a slot which is as chockfull of additional features and gameplay elements as a spaceship is of futuristic gadgets. Players benefit from three diverse game modes, a random Ion Storm feature, wild symbols which work in a variety of different ways and potentially very beneficial free spins. 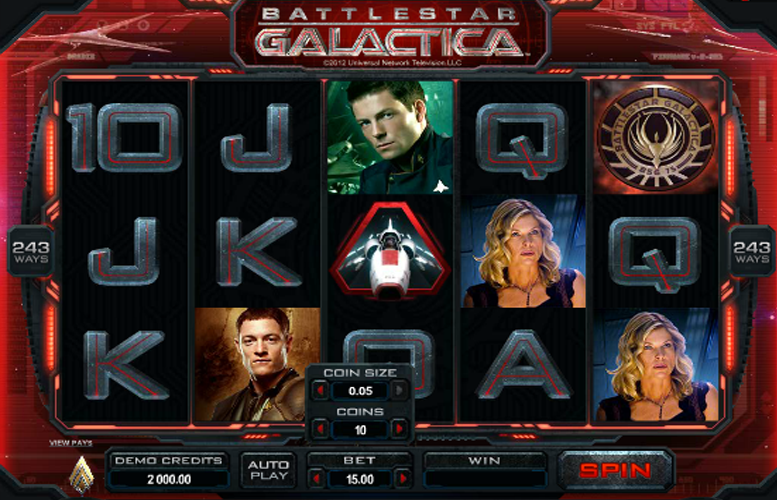 Those players who like their slot games to be engrossing and immersive, then, are sure to love Battlestar Galactica. What’s more, the slot also excels in terms of general aesthetics. The reels feature real images of characters from the TV show and actual video content can also be unlocked as the game progresses. Whilst it can be a little complicated to work out exactly what combinations are worth, the slot’s payouts are also generally quite generous. There is, then, plenty to like about Battlestar Galactica. This game has a rating of 4 / 5 with 678 total reviews by the users.